Pyrosphere in Super Smash Bros. for Wii U.
Pyrosphere (パイロスフィア, Pyrosphere) is a stage in Super Smash Bros. for Wii U and is based on the Pyrosphere area in Metroid: Other M.
The main body of Pyrosphere is a fairly long platform with a metallic surface mounted on top of a tall metal shaft extending down below the surface of the lava. Above it floats four metallic platforms sporting green glowing strips wrapped around them. The lava appears pouring in the background, but doesn't affect the playing area. Ridley appears periodically as a boss, who will attack players and destroy floating platforms. He can increase his strength from absorbing energy from the tanks under the ledges, which blackens his skin in the process. If he receives enough damage, he will become an ally to the last attacker. Defeating him counts as a point in Timed matches. FG II-Grahams, Joulions, and Zeros appear as enemies on the stage as well. FG II-Graham units are mobile flying turrets that fire straight shots when hit. Joulions are floating enemies that inflate and explode after being attacked. The weighty Zeros crawl slowly on the ground, and can be picked up and thrown. The main platform is used in the Ω form. Ridley, enemies, and smaller platforms do not appear. The Geothermal Power Plant in Metroid: Other M.
In Metroid: Other M, Samus is ordered by her commander, Adam, to venture into the hazardous Sector 3 (Pyrosphere) area of the Bottle Ship to track down the Mystery Creature that attacked her in Sector 1 (Biosphere). Along the way, she saves Anthony Higgs, a Galactic Federation soldier, from a Rhedogian and later meets him again at the Geothermal Power Plant. It is here that Samus and Anthony encounter the Mystery Creature's new form, which Samus realizes is her longtime enemy, Ridley, who was illegally cloned by a group of Galactic Federation scientists that obtained his DNA in an attempt to create bioweapons. Samus engages and defeats the cloned Ridley, who actually feigns death and escapes by breaking through one of the walls. This stage in SSB4 is based on the Geothermal Power Plant of the Pyrosphere where Samus and the cloned Ridley fought. 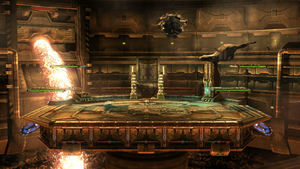 This stage's appearance is mostly the same as it is in Metroid: Other M; the bridge that Ridley burns down, the magma-eruption port that Samus destroys to light the area, and the hole in the wall that Ridley creates while escaping are all in their post-battle state in SSB4, though the hole has been moved slightly to the right and there is another hole to the right of the door for unknown reasons. The four floating platforms of the stage are not present in Other M, however. During the fight at the Geothermal Power Plant against Ridley, he could harden his skin to render himself invulnerable to Samus' Plasma Beam, signified by his darkened skin. In SSB4, he absorbs the energy from the vats on either side of the stage to further augment his strength. The result is erroneously stated as a transformation into Meta Ridley in the English translation of the 50-Fact Extravaganza; the Japanese version calls it 黒リドリー instead, which is more accurately translated as Black Ridley and does not reference the Metroid Prime series. Pyrosphere is banned from tournaments due to the random and disruptive nature of its hazards. This applies to the FG II-Grahams, Joulions, and Zeros, but most importantly to Ridley: his attacks cover large portions of the stage, he can take attacks intended for other players due to his massive size, and he gives the player he sides with a very significant advantage, KO'ing characters at unrealistic percentages. Attacking Ridley with the Dragoon when he is about to dive onto the stage will make him function in the background instead of the foreground. However, his fireballs remain potent, and he can still destroy the floating platforms. In this state, he can only be defeated by the use of Dragoons. Ridley behind Zero Suit Samus. The first screenshot of the stage. Link and Kirby on Pyrosphere. Donkey Kong, Mario, and Luigi on Pyrosphere. Air view of the lava pit. Samus is in her morph ball form, and Fox can be seen walking off screen. Mario, Bowser, and Peach on Pyrosphere. A clear view of both holes in the wall. A close-up of one of the holes in the wall in the background. Ridley's shadow shown in the 4/8/14 Nintendo Direct. Ridley getting energy from the vats under the stage. Added 8-player mode version of the stage (already had an 8-player Ω form). This version of Pyrosphere removes Ridley and other stage hazards. Additionally, there is no flowing lava in the background, even though the lava flows in the 8-player Ω form. The specifics of Ridley's role on Pyrosphere was withheld from Miiverse over a year after its announcement on August 20, 2013, when Masahiro Sakurai revealed the stage with a caption stating "An enemy from Samus's past may appear at any second…" On the April 8, 2014 Nintendo Direct, Sakurai confirmed that stage bosses would appear after showing off the Yellow Devil with a clip of Pikachu being chased by Ridley on the stage - although only his shadow, wings, and tail could be seen - implying that he was set to be a boss on the stage. Ridley was eventually shown and his role as a stage boss was ultimately detailed in the October 2014 Super Smash Bros. for Wii U 50-Fact Extravaganza. Pyrosphere appears as a stage in Dead or Alive: Dimensions as the "Geothermal Power Plant", with Ridley as a stage hazard but without floating the platforms featured in Super Smash Bros. for Wii U. This makes it one of six stages in the Super Smash Bros. series to be featured as a stage in other fighting games, the others being the Green Hill Zone, Fountain of Dreams, Suzaku Castle, Midgar, and Dracula's Castle. Of these, it is the only one that has not appeared as a stage in a fighting game in the same series it originates from. It is also the only one of these stages not to appear in Ultimate, and one of five stages from Super Smash Bros for Wii U not to return in Ultimate, the others being Orbital Gate Assault, Woolly World, Jungle Hijinxs and Miiverse. In Pyrosphere's case, it is most likely due to Ridley being a playable character. This page was last edited on April 17, 2019, at 02:51.